1. It is gorgeous in the springtime. So I kind of imagined that all of this Paris-in-April stuff was mainly hype, brought about by people who visited during the month and wanted to make other people jealous. Not so. 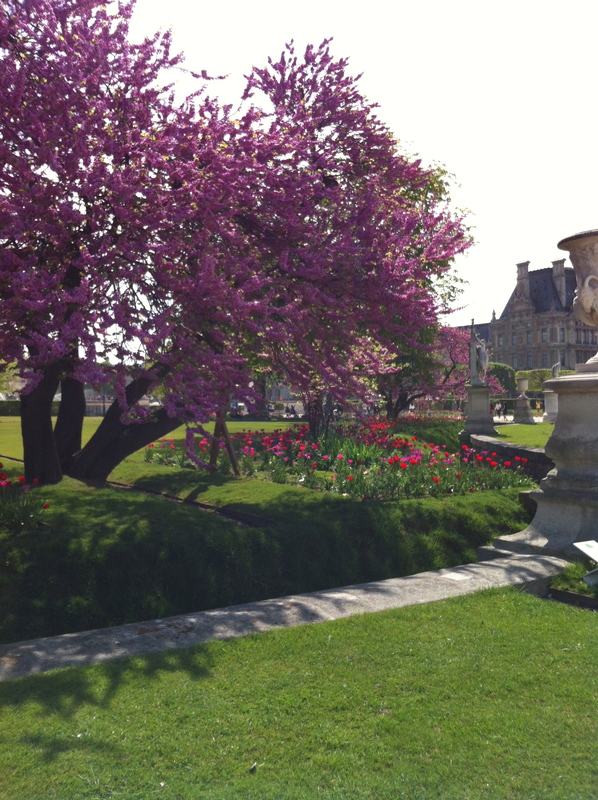 This city is stunning: flowers in every color, closely manicured gardens, blooming lilac, green trees, pink trees, white trees. It is certainly the charm of spring, and I have indeed met it face-to-face. *Note: Perhaps because of the season, there is also what appears to be near-constant spring fever; couples and love rule this city. Case in point: pretty trees. 2. Parisians take things slowly. Mainly this is a good thing; it reminds me to do things like sit on a park bench or at a café for hours. That’s not my normal speed, and slowing down is much appreciated. I will say, though, that every once in a while, I am walking behind a group of people who are moving so slowly that I have to actually stop, in order to gain enough distance to get going for a moment or two. It’s like being on the DC beltway, only on foot and in a much lovelier place. *Note: I am not complaining; there are worse things. I spy an inspiration (I decided to read too). 3. Hungry (or not), grab a baguette and keep walking. I know this is one of the quintessential stereotypes and there’s a reason. Parisians love their bread. From what I can tell, there is always a line out the door of every single boulangerie in the city, regardless of time of day. Most people walk out with a couple. There’s an intense pressure surrounding this. I did not want a baguette last night but I bought one anyway, and ate most of it on the way home. In fact, I am eating one now. *Note: If not a baguette, most Parisians will be carrying a panini, all of which – I imagine for no good reason, really – are made with jambon. 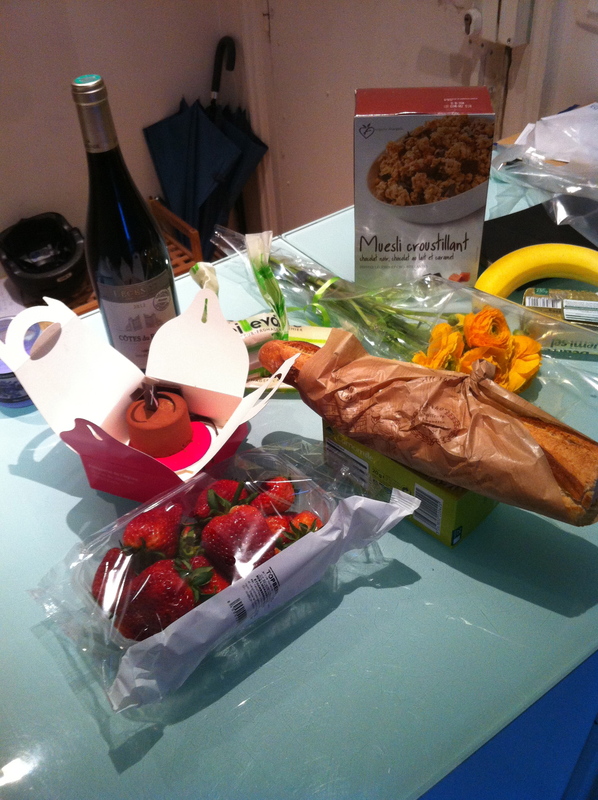 What’s that baguette doing there, hiding among my groceries? 4. This town is for the birds. 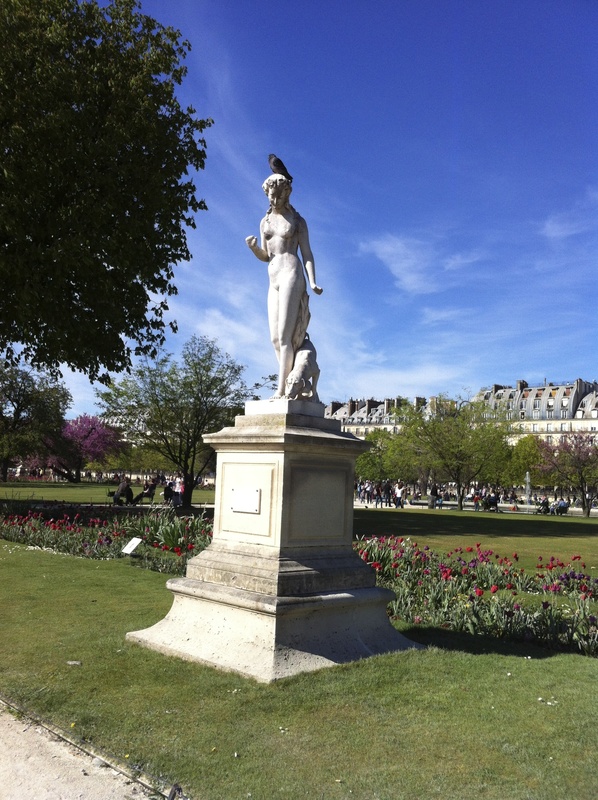 Pigeons and crows abound: in parks, on street corners, atop statues. They’re well-fed and fearless; one swooped so close to me the other day that I felt the swish of its wing upon my cheek. They are also huge. I’m pretty sure they could easily take down one of the many Jack Russell terriers strolling sans leashes along the streets. *Note: A lot of people also carry their dogs here, some in their arms, some in little pet vehicles of various sorts, some strapped to their chests like an infant. Perhaps it is all in anticipation of a pigeon-snatching. Quick – who can find the bird!? Oh, wait – who can’t? 5. Chocolate. Wine. Cheese. Répétez! Chocolate yogurt. Wine at lunch. Adorable twentysomethings who share impassioned insight into the nuances of fromage. There’s no doubt that the French take their food seriously; it’s possible to spend a few euro and get a decent bottle of wine, and even the train station croissants are better than 90% of those I’ve had in the States. I’m going to gain some weight, but it will be well worth it. *Note: Now that I’ve finished my baguette, I am moving on to the pot de crème that I cleverly grabbed from the refrigerated section of the MonoPrix. Wine’s here too. C’est tout! …and that’s what posed for dinner tonight. This entry was posted in Paris. Tagged food, Paris, stereotypes. Yikes– fat and fearless pigeons. Scary. And let us not forget the insane amount of bird poo! 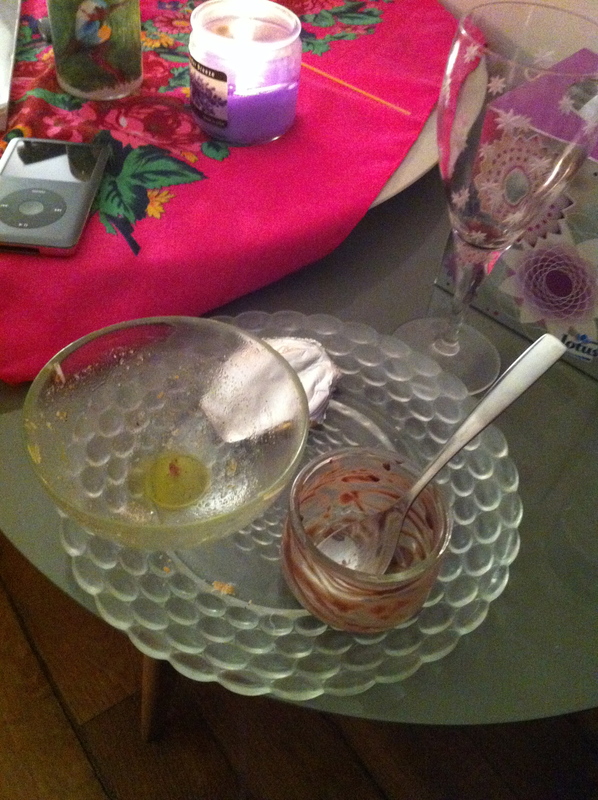 But the chocolate, wine, cheese and bread make the flocks so worth it. Indeed! A kind waiter pulled me out of the line of pigeon fire last night by suggesting I switch seats while drinking my champagne. Sounds pretty good! I love walking slow, sitting on benches and watching birds! If only I could come visit for my self….